My friend Kristen at La Dolce Vita has one of my favorite Etsy shops around! She makes hand-stamped jewelry that is amazing, and also donates portions of her proceeds to a different charity each month. December's featured charity will be Toys for Tots. The primary goal of Toys for Tots is to deliver, through a shiny new toy at Christmas, a message of hope to needy youngsters that will motivate them to grow into responsible, productive, patriotic citizens and community leaders. 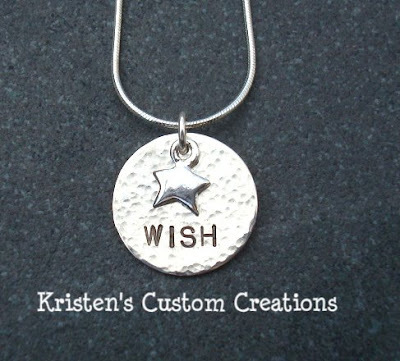 Kristen's new beautiful necklace, offered in the December promotion, has a hammered disc stamped with "Wish" and an added sterling star charm. It's gorgeous! On sale to my readers first, the necklace is being sold in her Etsy shop for $39.90 with $5 of each sale being donated to Toys for Tots. With your purchase you can help put a present under a child’s tree. For one week only, she's decided to offer this necklace as a giveaway to one of my lucky readers! 1. Comment on this post on what you truly Wish for this holiday season. 2. Post about this contest on your blog, using this code button. -post a comment on Kristen's site, and let me know you've done so in my comments. -Post the above button in your sidebar for the length of the contest, and let me know you've done so in my comments. Contest is open to US Residents only and runs from today through Wednesday, November 19, noon Eastern time. A lucky winner will be chosen by Random. Org and verified that they've followed the rules. Good Luck! I truly wish for a happy, safe and memorable holiday season! I have also posted this in my side bar! I really want to win this~! pick me pick me pick me!!!! I LOVE Kristen's items and would love to add another to my collection. I wish for a peaceful holiday season!!! If you knew my in-laws, you would understand what a big wish this really is!!!! I have added the button to my sidebar and left a comment on Kristen's blog. Thanks for the giveaway!! She is so talented! I just wish for the energy to shop and get my house ready for the holidays. A case of No-Doze should do it. I wish for everyone to remember the reason for the season - not gifts, but peace, harmony and love. I blogged about the giveaway, left a comment for Kristen on her blog and added the button to my sidebar. My wish is for my whole family to be healthy, safe, and happy! AND I posted a comment on her blog! I came, I blogged, I posted the button in and on the sidebar of my blog. Now, I want to tell you that do truly wish that all children wake up to a joyous Christmas morn! I wish for my son's happiness. I also left a comment on Kristen's site :) She has awsome work! I have posted about it on my blog, linked it up and am ready to win!!! Man I am as bad as my step-son. I should read ALL the directions before I jump into a project! LOL. Entry number 2. I really hope I win. I have been tossing and turning for the last two nights stressing about how I am going to by for Christmas this year. Boy would this help out! Entry 3! Left a comment for Kristen - entry #2! Added the button to my sidebar! Entry #3! I am wishing for good grades in my two classes and that I take time to appreciate the true meaning of Christmas this year with my family. very nice. How thoughtful of you. I wish for my friend Karen to stay a survivor. I have completed the other requirements. Absolutely have to wish for snow for Chritmas adn my kids happiness, and maybe a good bottle of scotch? hi. i found you from Jenn's blog... My Kids Are My World... I saw that you, too, followed her blog. First... My wish for this years holiday season is NO STRESS! No stress for anyone in my family... no financial stress, or holiday buying stress or family stress... just happiness and joy and being together to enjoy this wonderful time of year. I'm off to post about your give-away and great blog you have... and I'll be back. glad I found your blog... and your contest. I just posted about this contest and linked it to your blog!! :) I really love this necklace and can't wait to see who wins it!! I have also added your button to my side bar!! I'm off to check out your friends Esty store!! :) and more of your blog!! I wish for a digital camera so I can take pics of my baby. Mine broke a long while back,I've missed so many special moments. I truly wish for people to get back into the real spirit of Chrismtas! i wish that i win this karaoke competition that i have against my cousin this holiday season!!! IT'S ON!! :) we have so much fun! i wish for a happy safe holiday season, and a healthy baby due shortly after!!! commented in Kristen's blog too!!! I wish for enough, for my family and every other family in the world. Aaand I just commented on Kristen's blog. I also added the button to my sidebar, and posted about the giveaway. 3. to figure out a gift for my husband! I posted about this on my blog. I really do think this is a great giveaway! AND I commented on Kristen's site, too. Your button is in my sidebar until this ends! I'll also add this to my contest corner. 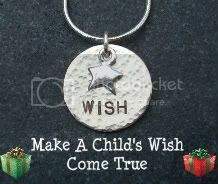 I truely wish for my children to value the true meaning and magic of Christmas! I wish my dad's cancer would disappear, and I believe miracles can happen, so that is my wish. I truly wish for health and happiness for my family. Ok I also commented in Kristen's Blog. And 3rd I put the button on my own blog page. Thanks for the chances!! I am wishing for a healthy Holiday season this year! I wish for everyone to have health insurance. My wish is that the time flies by before my mom is home in Louisiana again... for good!! I posted about the contest! My comment has been posted at Kristen's site! Ok, I got everything done! Whew! I left Kristen a comment about how cute this necklace is! i would feel selfish winning this for ME because i have a beautiful creation by her already and i wear it daily. So if i win, i will give to to alicia. I truly wish that the people around me know how much i love and care for them, that my family stays happy and healthy, and my friends start off the new year with all they wish for. I would wish that everyone has family or good friends to be with, warm food in their bellies, and safe place to go home to this Christmas. Thanks! My Christmas wish.... a healthy, happy holiday for us all. I have finally gotten the little sidebar step done :) It only took me until the weekend when I wasn't working. LOL! I hope that I can make Christmas special for my kids since money is tight. I wish things to get better and have a greater wonderful upcoming year. I am just getting to post this. I really want our Christmas to be free of any accidental nut exposures this year. I just want to enjoy Christmas without worrying something is going to happen to my son, who is deathly allergic. I am off to post the button now. Just left a message over at Kristin, I think that was the name... She has nice stuff. Thanks for running this one. That necklace is adorable and I love how the sales are helping toys for tots. My wish for this season is that with the stress of the times we remember to be thankful for what we have. I also wish that everybody will help their neighbors or those they know who have been affected by our economy to have a Merry Christmas. Thanks for a great giveway! I visited Kristen and commented on her Giving from the Heart post. By the way that is another beautiful necklace. Posted about the giveaway over at my place. I hope you get more comments, but that they don't win ;-) and that Kristen can sell more necklaces. You can find your button with all my Christmas buttons on my sidebar! I really wish everyone has a safe holiday!! I also wish for myself that my kids would not fight for 1 day! That would be amazing!! I just posted a comment at Kristins Blog for my second chance to win!! I wish for all the hurting people who have posted prayer requests at Mckmama's blog (www.mycharmingkids.net) to be touched by the power of prayer in numbers. And I'm adding your button now! just posted at Kristin's. Chance #2! I wish for a happy, healthy season!! The button is in my sidebar! I posted a comment on Kristen's blog! I wish for everyone to have a VERY Merry Christmas! I put the button in my sidebar! I left a comment on Kristen's blog! What I truly wish for this christmas is that my son, Tony, a Marine, (and his buddies)finds out he doesn't have to go to Iraq next year and he makes it home safely for christmas with the family! I posted the button in my sidebar! My husband goes overseas to visit his mom every Christmas. My daughter will turn 18 this year on Dec 31. Her dad has missed the last 6 of her birthdays. I truly wish he would stay home this year and be with her on this, her very important 18th birthday. Soon she will start college and begin the process to be out on her own. I posted a comment on Kristen's blog. I wish my dad were here to celebrate the holidays...it's been a little over a year since we lost him but it doesn't get any easier. I've posted about this contest on my blog. I've also posted the button on my side bar. I also posted my "wish" on Kristen's blog. I truly wish for a great job. I have been a stay at home mom for fourteen years and have to go back to work. I have put applications with my resume everywhere and still nothing. I left a comment on Kristen's blog! Thanks so much! You should post this at the new message board that just went up on my site.